This is an exhibition catalogue. 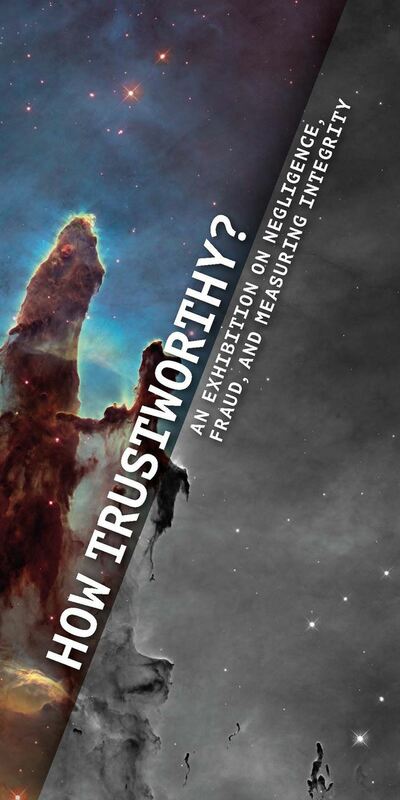 The goal of this exhibition is to increase awareness about research integrity. The exhibition highlights areas where both human errors and intentional manipulation have resulted in the loss of positions and damage to careers. Students, doctoral students, and early career scholars especially need to recognize the risks, but senior scholars can also be caught and sometimes are caught for actions decades earlier. There is no statute of limitations for breaches of good scholarly practice. This exhibition serves as a learning tool. It was designed in part by students in a project seminar offered in the joint master's programme on Digital Curation between Humboldt-Universität zu Berlin and King's College London. The exhibition has four parts. One has to do with image manipulation and falsification, ranging from art works to tests used in medical studies. Another focuses on research data, including human errors, bad choices, and complete fabrication. A third is concerned with text-based information and discusses plagiarism as well as fake journals and censorship. The last section covers detection and the nuanced analysis needed to distinguish the grey zones between minor problems and gross negligence in case of fraud. Detecting fraud is important and it is equally important for people in decision-making roles to understand when actual long term damage to scholarship has taken place, and when scholars have done something wrong but without negative consequences in the long run to both science and scholarship in general. Students especially need to learn the distinction between error and intent, negligence and gross negligence. Everyone makes mistakes, but undermining the reliability of scholarly results harms the whole scholarly community.